So why wasn't the entire corridor (Tallahassee-Pensacola) simply given a single US route number (rather than two different designations sharing a common terminus in Apalachicola)? Possibly because of the signed direction of travel. 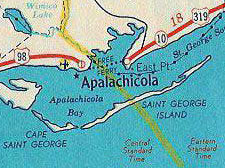 Obviously US 98 between Pensacola and Apalachicola is east-west. But, even though one could argue that US 319 between Apalachicola and today's US 98-319 junction east of Carrabelle could also be signed east-west, US 319 from that junction up to Tallahassee has a strong north-south bearing. ​Eastpoint is about four miles ahead (within about one year, the vegetation shown in those photos was severely reduced, thanks to Hurricane Ivan). What an odd place for a route designation to terminate: it makes no sense for US 319 to be overlapped with US 98 for 30 miles, only to end at this non-descript point.